And emergency room visits have essentially doubled since 2005. 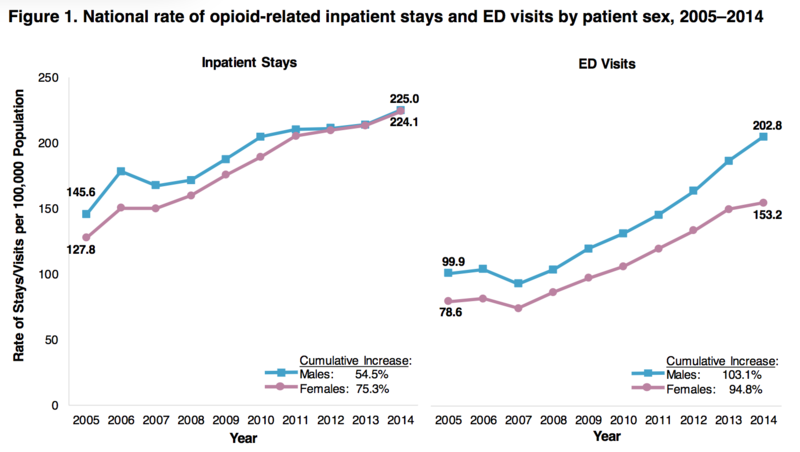 A government study released Tuesday examined the opioid-related inpatient stays and emergency room visits from 2005 and 2014 and saw a staggering increase across the United States. Hospitals have been inundated with a 64 percent increase in inpatient visits since 2005 and emergency room visits have essentially doubled, increasing more than 94 percent for both males and females. The data, compiled by the Agency for Healthcare Research and Quality, underscores the extent to which the opioid epidemic is sweeping the nation. People on opiates, including heroin and prescription painkillers, end up in the hospital due to a variety of reasons, including overdoses, injuries associated with drug use, and adverse reactions to opioid-antidotes like Narcan. According to the data, patients ages 25-44 had the highest increase in emergency room visits, climbing by more than 109 percent total. While males had a higher rate of inpatient stays in 2005, the female rate quickly caught up, making men and women equally represented in hospital beds around the nation.